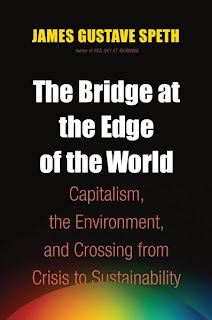 I just finished reading The Bridge at the Edge of the World: Capitalism, the Environment, and Crossing from Crisis to Sustainability and came away mystified (not in a good way). The author, James Speth, is one of the great heroes of the American environmental movement. He co-founded the National Resources Defense Council, founded the World Resources Institute, led numerous United Nations' environmental initiatives and currently serves as Dean of the Yale School of Forestry and Environmental Studies -- the nation's premier training ground for environmental leaders. How serious is the threat to the environment? Here is one measure of the problem: all we have to do to destroy the planet's climate and biota and leave a ruined world to our children and grandchildren is to keep doing exactly what we are doing today, with no growth in the human population or the world economy. Just continue to release greenhouse gases at current rates, just continue to impoverish ecosystems and release toxic chemicals at current rates, and the world in the latter part of this century won't be fit to live in. But, of course, human activites are not holding at current levels -- they are accelerating, dramatically. Speth has done a voluminous amount of research and does a wonderful job summarizing and weaving together environmental and economic research to paint a picture of a world in crisis. Perhaps his greatest contribution to the debate is that he brings in the latest findings from the newly emerging field of happiness research (Martin Seligman and others) to show that after a certain point, increased income does not lead to increased happiness -- so it's silly for all of U.S. economic policy and indeed U.S. public policy to be based on increasing GDP. But as I waded deeper into the book, I grew alarmed. The book, is almost completely apolitical. The book contains no analysis of power and how power works in society. No analysis of the actors involved, no mention of political parties, no mention of the fact that Democrats have been carrying water for the environmental movement since its inception and Republicans will do anything to serve their corporate friends. (Interestingly, there is also no mention of Yale's role in training many of these corporatists who are destroying the planet, no mention of Yale's endowment or how it is being used in ways that contribute to environmental catastrophe.) No mention of torture, or death squads, or genocide and how those violent acts are employed in the pursuit of wealth. He's literally talking about the death of the planet, and yet he refuses to name its executioners. It's a little bit like trying to tell the history of World War II without mentioning the names of the countries involved or their leaders. It is startlingly to put The Bridge at the Edge of the World up against Naomi Klein's Shock Doctrine: The Rise of Disaster Capitalism or Derrick Jensen's The Culture of Make Believe. All three books cover similar ground (in fact, Speth borrows heavily from Shock Doctrine but never quotes Klein nor gives her any credit) but unlike Speth, Klein and Jensen show who is responsible for the atrocities, why they are doing it, and provide a bracing account of just how difficult it will be to counteract corporate power. I get what Speth's trying to do. I really do. He's trying to gently reach out to Republicans and corporatists to try to get them to finally, eventually, correct course and do the right thing (while still basically explaining how bad things are). But by failing to speak truth to power, by pulling his punches for fear of alienating those responsible -- it seems to me that he perpetuates the very power dynamics that have gotten us into this mess in the first place. Besides, Speth's apolitical strategy isn't likely to work. Those most responsible for the planet's demise are unlike to pick up the book in the first place -- and even less likely to understand or act upon his suggestions. No one gives up power willingly. If we're going to replace the capitalist system with something better (as he recommends), it will require TAKING power away from those who have pursued wealth without conscience (which he fails to mention). So if you're looking for some helpful data, the first few chapters of The Bridge at the Edge of the World are excellent. But if you're looking for a blueprint for what to do about it, this ain't it (I'd recommend reading Shock Doctrine instead). Update #2: I read this quote today (in The Sun) "Power concedes nothing without a demand. It never did and it never will." --Frederick Douglass. That's my problem with this book. It just never makes a demand on power.